Pictured above you will see one of our recent insalls in Belvedere, CA. 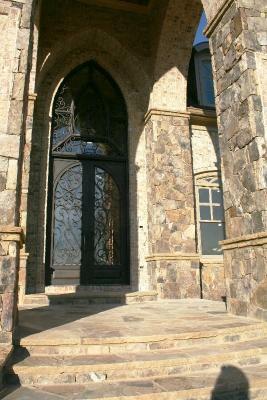 This beautifull unique Iron entry door has a gothic arch transom that compliments the homes stonework and creates a cathedral like atmosphere. 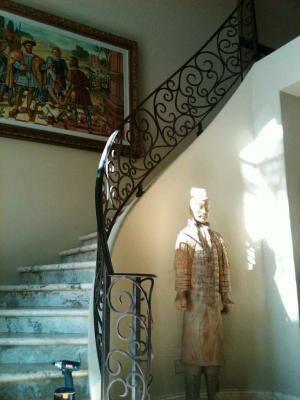 When approaching this entryway you feel transported back in time and it only continues once you enter the home to see the beautiful hand forged custom iron railing cascading down the stairway. As a resident of Belvedere, it gives you the feeling of being a member to an exclusive club that has the opportunity to have some of the most beautiful views in the country.Whether its of Mount Tamalpais, Angel Island or the Golden Gate Bridge, few places in this country can come close to matching the beauty you get to experience when you walk out your back door. Why not allow your home to compete with the natural beauty of the ocean views that surround it and why not let it represent you? Signature Iron Doors can create in iron what you can imagine, and we invite you to visit our website and contact us to help you give yourself the home that will make your ocean views applaud.